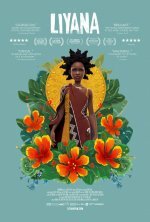 Liyana release date was Wednesday, October 10, 2018. This was a Limited in theaters release. Under the guidance of acclaimed South African storyteller, Gcina Mhlophe, five orphaned children from Swaziland collaborate to craft a collective fairytale drawn from their darkest memories and brightest dreams. Their fictional character, Liyana, is brought to life in innovative animated artwork as she embarks on a perilous quest to rescue her young twin brothers. The children’s real and imagined worlds begin to converge, and they must choose what kind of story they will tell - in fiction and in their own lives.